Paolo Spirito, M.D., Christine E. Seidman, M.D., William J. McKenna, M.D., and Barry J. Maron, M.D. From the Servizio di Cardiologia, Ospedale Sant’Andrea, La Spezia, Italy (P.S. ); the Howard Hughes Medical Institute and the Cardiovascular Division, Brigham and Women’s Hospital, Boston (C.E.S. ); the Department of Cardiological Sciences, St. George’s Hospital Medical School, London (W.J.M. ); and the Minneapolis Heart Institute Foundation, Minneapolis (B.J.M.). Address reprint requests to Dr. Spirito at the Servizio di Cardiologia, Ospedale Sant’Andrea, Via Veneto 197, La Spezia 19100, Italy. Hypertrophic cardiomyopathy is a complex cardiac disease with unique pathophysiologic characteristics and a great diversity of morphologic, functional, and clinical features. (Ref. 1-8) The heterogeneity of the disease is accentuated by the fact that it afflicts patients of all ages. During the past few years, technological developments in implantable defibrillators and pacemakers have provided new therapeutic options for patients with the disease. (Ref. 9-18) In addition, rapid advances in our knowledge of the molecular defects responsible for hypertrophic cardiomyopathy have deepened our understanding of the disorder and have suggested new approaches to the assessment of prognosis. (Ref. 19-22) These recent developments, however, have also generated considerable uncertainty and raised new questions about the optimal management of hypertrophic cardiomyopathy. In this article we critically reexamine and place in perspective the most appropriate therapeutic strategies for these patients. Recent observations suggest that the prevalence of hypertrophic cardiomyopathy in the general population is higher (about 1 in 500) than previously thought. (Ref. 23) The condition therefore appears to be a common genetic malformation of the heart. The clinical course varies markedly; some patients remain asymptomatic throughout life, some have severe symptoms of heart failure, and others die suddenly, often in the absence of previous symptoms. (Ref. 1-8) The heterogeneous natural history of the disease and the fact that patients with severe symptoms are preferentially referred to tertiary care centers have been major impediments to assembling large study populations that truly represent the overall spectrum of the disease. Indeed, because most of the literature on hypertrophic cardiomyopathy is derived from investigations performed at tertiary care centers, (Ref. 6) the clinical picture of the disease that has emerged from published studies is profoundly influenced by referral bias. (Ref. 6, 24-29) This is evident in the fact that the annual mortality figures for hypertrophic cardiomyopathy from such institutions (3 to 4 percent overall and up to 6 percent in children) (Ref. 1, 3, 5, 30-32) are substantially higher than those recently reported in unselected populations (1 percent or less). (Ref. 6, 24-29) These observations suggest that in a substantial proportion of patients the disease has a more favorable clinical course than previously believed. Strategies for treatment should therefore rely on data from relatively unselected populations, as well as from studies at tertiary care referral centers, and on the clinical experience of physicians who have focused their investigative efforts on this disease and acquired particular expertise in its management. Molecular studies of the genetic alterations responsible for hypertrophic cardiomyopathy also provide insight into the heterogeneity of its clinical features. The disease can be caused by a mutation in one of four genes that encode proteins of the cardiac sarcomere: the β-myosin heavy-chain, cardiac troponin T, α-tropomyosin, and myosin-binding protein C genes (Fig. 1). (Ref. 19-22, 34-37) In addition, mutations in the two genes encoding the myosin light chains have been reported in what appears to be a rare form of hypertrophic cardiomyopathy, (Ref. 38) and other genes that cause the disease are likely to be found. (Ref. 39) This etiologic complexity is further compounded by intragenic heterogeneity; more than 50 disease-causing mutations have been identified in these genes of the sarcomere. (Ref. 19-22, 34-37) Hence, the precise molecular defect responsible for hypertrophic cardiomyopathy often differs in unrelated patients. Figure 1. Components of the Sarcomere. 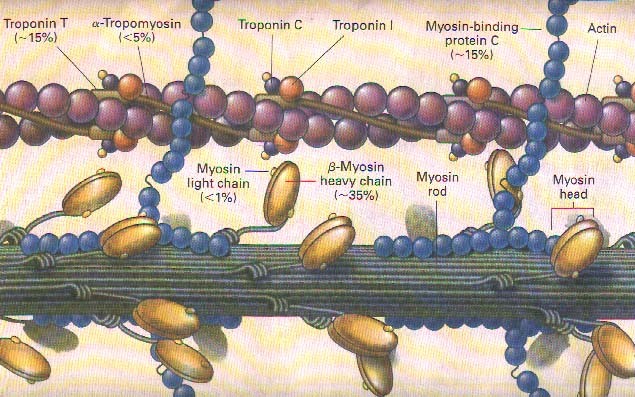 Cardiac contraction occurs when calcium binds the troponin complex (subunits C, I, and T) and α-tropomyosin, making possible the myosin-actin interaction. Actin stimulates ATPase activity in the globular myosin head and results in the production of force along actin filaments. Cardiac myosin-binding protein C, arrayed transversely along the sarcomere, binds myosin and, when phosphorylated, modulates contraction. In hypertrophic cardiomyopathy, mutations may impair these and other protein interactions, result in ineffectual contraction of the sarcomere, and produce hypertrophy and disarray of myocytes. Percentages represent the estimated frequency with which a mutation on the corresponding gene causes hypertrophic cardiomyopathy. Modified from Seidman and Seidman. (Ref. 33). The diverse clinical and genetic features of hypertrophic cardiomyopathy make it impossible to define precise guidelines for management. As in many diseases, it is often necessary to individualize therapy. In hypertrophic cardiomyopathy, the treatment of symptoms to improve quality of life and the identification of patients who are at high risk for sudden death and require aggressive therapy are two distinct issues that must be addressed by largely independent strategies. Figure 2. The Principal Clinical Presentations of Hypertrophic Cardiomyopathy and Corresponding Treatment Strategies. The size of the arrows indicates the approximate proportion of patients with hypertrophic cardiomyopathy in each subgroup. The dashed arrow indicates the present uncertainties regarding the size of this subgroup, and the question mark indicates the uncertainties regarding the therapeutic efficacy of pacing. The drugs are specified in the text. Disopyramide may reduce the gradient and relieve symptoms by virtue of its negative inotropic properties (Ref. 66); in many patients, however, the initial hemodynamic and clinical benefits decrease with time. (Ref. 3, 8) Because disopyramide may shorten the atrioventricular nodal conduction time and thus increase the ventricular rate during paroxysmal atrial fibrillation, supplementary therapy with beta-blockers in low doses is advisable. Drug selection is not standardized and is based, in part, on the experience and preferences of individual investigators. Most favor beta-blockers over verapamil as the initial treatment for exertional dyspnea, although it is not of critical importance which drug is used first. Some investigators confine the administration of verapamil to patients without outflow obstruction and use beta-blockers, disopyramide, or both for patients with obstruction; others administer verapamil if chest pain is the predominant symptom. There is no evidence that the administration of beta-blockers and verapamil together is more advantageous than the use of either drug alone. Patients who have no response to beta-blockers often have symptomatic improvement if given verapamil. (Ref. 5, 8, 55, 68) In some patients, this may be due in part to the withdrawal of the beta-blockers and the abolition of their associated side effects. (Ref. 69) In patients with a substantial outflow gradient or markedly elevated pulmonary pressure (or both), verapamil should be used with caution, because the drug’s vasodilative effects may lead to serious hemodynamic complications. (Ref. 5, 8, 70) The symptoms of patients who have congestive heart failure despite treatment with beta-blockers or verapamil may improve with the addition of a diuretic agent. (Ref. 3, 5, 8, 71) However, because many of these patients have diastolic dysfunction and require relatively high filling pressures to achieve adequate ventricular filling, it is advisable to administer diuretics with caution. In recent years, molecular genetic studies have enabled physicians to identify an increasing number of asymptomatic patients. (Ref. 19-22, 34-37) In addition, studies of relatively unselected populations not followed at referral centers have shown that many patients with hypertrophic cardiomyopathy have mild or no symptoms. (Ref. 6, 24-29) Taken together, these observations suggest that relatively asymptomatic patients probably constitute the majority of the overall patient population (Fig. 2). There is no evidence that either beta-blockers or verapamil protects patients with hypertrophic cardiomyopathy from sudden death. (Ref. 3, 5, 8) Whether these drugs should be used prophylactically to delay disease progression and improve the prognosis in asymptomatic patients has also been a subject of debate for many years. The effectiveness of prophylactic treatment has not been tested prospectively because study populations are small and the traditional end points (clinical deterioration and premature death) are infrequent. A further element of uncertainty is the growing awareness that an important proportion of patients with hypertrophic cardiomyopathy remain asymptomatic for many years and often have normal longevity. (Ref. 6, 24-29, 72-74) Therefore, treatment aimed at preventing the progression of disease does not appear justified in most asymptomatic patients. One possible exception may be patients with massive left ventricular hypertrophy (a maximal wall thickness of 35 mm or more in adults, or a comparable value in children). (Ref. 75, 76) The presence of such striking morphologic features usually represents a strong motivation to initiate pharmacologic treatment, even in the absence of symptoms. This decision is probably appropriate and is justified by the expectation that in the presence of massive hypertrophy the favorable effects of drugs on diastolic filling and myocardial ischemia might delay the onset of symptoms. Asymptomatic children or young adults with particularly marked outflow tract gradients constitute another subgroup in which physicians often feel the need to initiate prophylactic drug treatment. Although systematic data are not available on the effects of prophylactic therapy in this subgroup, it may be appropriate to initiate drug treatment with the expectation that it might reduce the hemodynamic burden and improve the clinical course of the disease. Atrial fibrillation is a particularly important arrhythmia in hypertrophic cardiomyopathy because it develops in a substantial proportion of adult patients (Ref. 28, 77) and is associated with an increased risk of systemic thromboembolism, heart failure, and death (Fig. 3). (Ref. 3, 5, 8, 77-80) Paroxysmal episodes of atrial fibrillation often cause rapid clinical deterioration by reducing diastolic filling and cardiac output, usually as a consequence of the high ventricular rate. Conversely, chronic atrial fibrillation is often well tolerated if the heart rate is adequately controlled. Figure 3. The Principal Pathways of Disease Progression in Hypertrophic Cardiomyopathy. Amiodarone is probably the most effective antiarrhythmic agent for the prevention of recurrences of atrial fibrillation. (Ref. 77, 78, 81-83) Beta-blockers and verapamil are usually efficacious in controlling the heart rate in patients with chronic atrial fibrillation, (Ref. 3, 5, 8, 77) but ablation of the atrioventricular node and the implantation of a pacemaker may be necessary in selected patients. Anticoagulant therapy is indicated in patients with recurrent or chronic atrial fibrillation. Since recurrences of even brief episodes of atrial fibrillation in hypertrophic cardiomyopathy have been associated with a substantial risk of systemic embolization, (Ref. 77, 79) the threshold for the initiation of anticoagulant therapy should be low. In some patients, medical therapy ultimately proves insufficient to control symptoms. At this point in the clinical course of the disease, subsequent therapeutic strategies are largely determined by the presence or absence of outflow obstruction (Fig. 2). The small subgroup of patients who have both a large outflow gradient (50 mm Hg or more) and severe symptoms of heart failure that are unresponsive to medical treatment are candidates for surgery. (Ref. 3, 5, 8) Whether patients with a marked gradient only under provokable conditions should also be considered candidates for surgery is unclear. In recent years, there has been growing interest in the potential use of dual-chamber pacing as an alternative to surgery in patients with hypertrophic cardiomyopathy. (Ref. 14-18) Some studies have reported that dual-chamber pacing is associated with both a substantial decrease in the outflow gradient and symptomatic improvement in patients with outflow obstruction and severe functional limitation who are unresponsive to drug treatment. (Ref. 16, 17) These observations, however, come from nonrandomized, unblinded studies and are based on the subjective perception of symptomatic improvement reported by patients over a relatively short period. The role of dual-chamber pacing for the relief of symptoms in obstructive hypertrophic cardiomyopathy is unclear, and a measured approach should be adopted in the use of this therapy. In addition, there is no evidence that pacing reduces the risk of sudden death or alters the clinical course of the disease. Recently, the injection of alcohol into the first major septal coronary artery has been proposed as a means of reducing both septal thickness and the outflow gradient in patients with hypertrophic cardiomyopathy. (Ref. 118) Experience with this technique, however, is as yet very limited. No single test can reliably predict risk in hypertrophic cardiomyopathy, and the complexity of the disease continues to be an important obstacle to risk stratification. Despite the difficulties in the assessment of prognosis, most investigators agree that some patients are at particularly high risk for sudden death and should be treated aggressively (Fig. 2) (Ref. 3, 5, 7, 8, 19, 22, 32, 120, 130): the rare patients who survive a cardiac arrest with documented ventricular fibrillation or who have episodes of sustained ventricular tachycardia, and young patients with a substantial family history of sudden death (defined as a cluster of two or more sudden deaths in young family members) or a high-risk mutation. There is no convincing evidence that electrophysiologic testing has an important role in identifying the patients with hypertrophic cardiomyopathy who are at high risk for sudden death. Standard programmed stimulation with two ventricular premature depolarizations seldom induces sustained ventricular tachycardia even in patients with hypertrophic cardiomyopathy who are known to be at high risk, such as survivors of cardiac arrest. (Ref. 138-140) Conversely, more aggressive protocols, with three ventricular premature depolarizations, frequently trigger polymorphic ventricular tachycardia or ventricular fibrillation even in patients with hypertrophic cardiomyopathy who are at low risk for sudden death (Ref. 139, 140); on the basis of experience in coronary artery disease, dilated cardiomyopathy, and hypertrophic cardiomyopathy, these latter arrhythmias are generally regarded as nonspecific responses. (Ref. 131, 139, 141) The induction of such arrhythmias in a patient thus does not justify aggressive treatment. The prognostic importance of syncope in hypertrophic cardiomyopathy is not completely understood, and the diversity of the mechanisms potentially responsible for this symptom makes management particularly complex. (Ref. 126-129, 142-144) These uncertainties have often led to the assumption that even a single syncopal episode is equivalent to aborted sudden death and may justify aggressive therapy. However, it should be emphasized that isolated and remote episodes of syncope are not in-frequently reported by patients (Ref. 27, 28) and that a history of recent syncope is uncommon in patients who have died suddenly. (Ref. 119) Furthermore, it is usually impossible to determine retrospectively the mechanism responsible for a single episode of syncope in a given patient. Therefore, patients with a single syncopal episode should be evaluated conservatively with noninvasive testing, including Holter monitoring, patient-activated event detectors, and the assessment of blood-pressure response during exercise. Patients with recurrent syncope are more problematic; their treatment constitutes one of the most difficult challenges in the management of hypertrophic cardiomyopathy. The treatment of such patients must be individualized and designed according to the potential role of each of the diverse mechanisms that may be responsible for syncope, including ventricular and supraventricular tachyarrhythmias, bradyarrhythmias, marked outflow obstruction, autonomic dysfunction, and complex interactions between myocardial ischemia and diastolic dysfunction that may lead to a sudden and marked decrease in cardiac output. Massive hypertrophy (defined as a maximal wall thickness of 35 mm or more in adults and the equivalent in children) is part of the morphologic spectrum of hypertrophic cardiomyopathy. (Ref. 75, 76) Such dramatic phenotypic expressions, however, are virtually never encountered in patients more than 50 years old, implying that most patients with these structural abnormalities die prematurely or undergo substantial left ventricular remodeling with wall thinning. (Ref. 84, 85, 145) The risk of sudden death associated with massive hypertrophy is uncertain. Nevertheless, the coexistence of this morphologic characteristic and one or more of the risk factors discussed above should arouse great concern and serve as an indication for prophylactic treatment. A recent approach to risk stratification in hypertrophic cardiomyopathy has focused on the impact of genotype on clinical outcome. The available data suggest that β-myosin heavy-chain mutations may account for approximately 30 to 40 percent of cases of familial hypertrophic cardiomyopathy. (Ref. 19-21, 34-37) The prognosis for patients with different myosin mutations varies considerably. Some myosin mutations are benign (e.g., Val606Met), whereas others are associated with premature death from either heart failure or sudden catastrophic events. (Ref. 19-21) The Arg403Gln mutation appears to be associated with markedly reduced survival. In families with this mutation, no more than 50 percent of the affected family members survived past 45 years of age. (Ref. 19) Cardiac troponin T mutations are estimated to account for about 10 to 20 percent of cases of familial hypertrophic cardiomyopathy. (Ref. 22, 34) The clinical manifestations associated with the eight reported cardiac troponin T mutations are similar. The cardiac hypertrophy is relatively mild and can be subclinical in some adults, but life expectancy is substantially reduced. (Ref. 22, 34) Collectively, these observations suggest that genetic data may have an increasing influence on the management of this disease. Although at present the identification of disease-causing mutations remains a complex and time-consuming endeavor, the identification of a genetic defect that is associated with adverse outcomes should prompt careful clinical assessment and intervention. Genetic diagnosis will also lead to the identification of increasing numbers of persons with preclinical hypertrophic cardiomyopathy (that is, with a genetic defect but no phenotypic alteration). The clinical implications of such genetic abnormalities have not been determined, and there is no evidence that assessment of the risk of sudden death or pharmacologic treatment is indicated, unless a malignant mutation is identified. 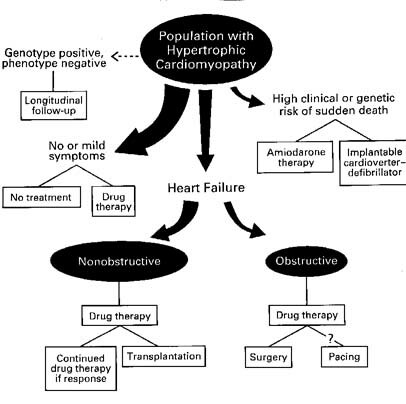 Although there is intense interest in genetic therapy for inheritable human conditions, the immediate application of this technology to hypertrophic cardiomyopathy is problematic. The disease is transmitted as an autosomal dominant trait, and affected persons have one mutated and one normal allele. Since most mutations cause the substitution of a single amino acid within the encoded protein, appropriate therapy would have to selectively inactivate the mutated gene, the encoded protein, or both. In patients with hypertrophic cardiomyopathy who are considered to be at particularly high risk for life-threatening tachyarrhythmias, the available therapeutic options for the prevention of sudden death are the same as in coronary artery disease or dilated cardiomyopathy — that is, amiodarone or the implantable cardioverter-defibrillator. (Ref. 9-12, 146, 147) The precise clinical criteria for choosing between these two treatment strategies have not yet been defined. A number of nonclinical factors may influence the choice, such as the availability of advanced technology and cost-benefit considerations. Furthermore, cultural differences in patients’ expectations and physicians’ attitudes may have an important influence on the decision. For example, in the United States, cultural factors and available resources predispose society to an aggressive pursuit of all therapeutic options; in many European countries more conservative strategies prevail. Systematic data are not currently available on the effectiveness of the implantable cardioverter-defibrillator in hypertrophic cardiomyopathy. It is a reasonable expectation, however, that the device will be effective in terminating life-threatening tachyarrhythmias. In addition, the pacing capabilities of the most recent defibrillators offer protection from cardiac arrest due to bradyarrhythmias. Therefore, the implantable defibrillator represents an important option for patients in the high-risk subgroups. The availability of a device with the potential to abort lethal arrhythmias and preserve life also presents clinicians with difficult decisions regarding which other patients should be offered this treatment. Because of the potential complications associated with the defibrillator, (Ref. 11, 12) as well as the awareness that the vast majority of patients will not die suddenly, we resist extending this therapy to patients other than those who can be definitively judged to be at high risk. Nevertheless, because of the imprecision of risk stratification, we believe that it would be unethical to withhold information about either the defibrillator or amiodarone from patients who are perceived to be at high risk, but in whom the prognosis cannot be reliably determined. Because of the persistent uncertainties, the prevention of sudden death in patients with hypertrophic cardiomyopathy continues to be an important challenge. Although many compelling questions remain unanswered, more definitive recommendations will undoubtedly emerge as new data become available. Supported by grants from the Consiglio Nazionale delle Ricerche and Telethon-Italia (to Dr. Spirito), the National Institutes of Health and Howard Hughes Medical Foundation (to Dr. Seidman), the British Heart Foundation (to Dr. McKenna), and the Minneapolis Heart Institute Foundation (to Dr. Maron). We are indebted to Dr. Liviu Poliac and Dr. Donald Fischman for assistance in preparing the figures. Frank S, Braunwald E. Idiopathic hypertrophic subaortic stenosis: clinical analysis of 126 patients with emphasis on the natural history. Circulation 1968;37:759-88. Goodwin JF. Congestive and hypertrophic cardiomyopathies: a decade of study. Lancet 1970;1:732-9. Wigle ED, Sasson Z, Henderson MA, et al. Hypertrophic cardiomyopathy: the importance of the site and the extent of hypertrophy: a review. Prog Cardiovasc Dis 1985;28:1-83. Maron BJ, Spirito P, Wesley Y, Arce J. Development and progression of left ventricular hypertrophy in children with hypertrophic cardiomyopathy. N Engl J Med 1986;315:610-4. Maron BJ, Bonow RO, Cannon RO III, Leon MB, Epstein SE. Hypertrophic cardiomyopathy: interrelations of clinical manifestations, pathophysiology, and therapy. N Engl J Med 1987;316:780-9, 844-52. Spirito P, Chiarella F, Carratino L, Berisso MZ, Bellotti P, Vecchio C. Clinical course and prognosis of hypertrophic cardiomyopathy in an outpatient population. N Engl J Med 1989;320:749-55. Louie EK, Edwards LC III. Hypertrophic cardiomyopathy. Prog Cardiovasc Dis 1994;36:275-308. Wigle ED, Rakowski H, Kimball BP, Williams WG. Hypertrophic cardiomyopathy: clinical spectrum and treatment. Circulation 1995;92:1680-92. Mirowski M, Reid PR, Mower MM, et al. Termination of malignant ventricular arrhythmias with an implanted automatic defibrillator in human beings. N Engl J Med 1980;303:322-4. Powell AC, Fuchs P, Finkelstein DM, et al. Influence of implantable cardioverter-defibrillators on the long-term prognosis of survivors of out-of-hospital cardiac arrest. Circulation 1993;88:1083-92. Nunain SO, Roelke M, Trouton T, et al. Limitations and late complications of third-generation automatic cardioverter-defibrillators. Circulation 1995;91:2204-13. Zipes DP. Are implantable cardioverter-defibrillators better than conventional antiarrhythmic drugs for survivors of cardiac arrest? Circulation 1995;91:2115-7. Hassenstein P, Storch HH, Schmitz W. Erfahrungen mit der Schrittmacherdauerbehandlung bei Patienten mit obstrucktiver Kardiomyopathie. Thoraxchirurgie 1975;23:496-8. Duck H-J, Hutschenreiter W, Pankau H, Trenckmann H. Vorhofsynchrone Ventrikelstimulation mit verkurzter a.v. Verzogerungszeit als Therapieprinzip der hypertrophischen obstruktiven Kardiomyopathie. Z Gesamte Inn Med Ihre Grenzgebiete 1984;39:437-47. McDonald K, McWilliams E, O’Keeffe B, Maurer B. Functional assessment of patients treated with permanent dual chamber pacing as a primary treatment for hypertrophic cardiomyopathy. Eur Heart J 1988;9:893-8. Jeanrenaud X, Goy JJ, Kappenberger L. Effects of dual-chamber pacing in hypertrophic obstructive cardiomyopathy. Lancet 1992;339:1318-23. Fananapazir L, Epstein ND, Curiel RV, Panza JA, Tripodi D, McAreavey D. Long-term results of dual-chamber (DDD) pacing in obstructive hypertrophic cardiomyopathy: evidence for progressive symptomatic and hemodynamic improvement and reduction of left ventricular hypertrophy. Circulation 1994;90:2731-42. Slade AKB, Sadoul N, Shapiro L, et al. DDD Pacing in hypertrophic cardiomyopathy: a multicentre clinical experience. Heart 1996;75:44-9. Watkins H, Rosenzweig A, Hwang D-S, et al. Characteristics and prognostic implications of myosin missense mutations in familial hypertrophic cardiomyopathy. N Engl J Med 1992;326:1108-14. Schwartz K, Carrier L, Guicheney P, Komajda M. Molecular basis of familial cardiomyopathies. Circulation 1995;91:532-40. Marian AJ, Roberts R. Recent advances in the molecular genetics of hypertrophic cardiomyopathy. Circulation 1995;92:1336-47. Watkins H, McKenna WJ, Thierfelder L, et al. Mutations in the genes for cardiac troponin T and α-tropomyosin in hypertrophic cardiomyopathy. N Engl J Med 1995;332:1058-64. Maron BJ, Gardin JM, Flack JM, Gidding SS, Kurosaki TT, Bild DE. Prevalence of hypertrophic cardiomyopathy in a general population of young adults: echocardiographic analysis of 4111 subjects in the CARDIA Study. Circulation 1995;92:785-9. Shapiro LM, Zezulka A. Hypertrophic cardiomyopathy: a common disease with a good prognosis: five year experience of a district general hospital. Br Heart J 1983;50:530-3. Kofflard MJ, Waldstein DJ, Vos J, ten Cate FJ. Prognosis in hypertrophic cardiomyopathy observed in a large clinic population. Am J Cardiol 1993;72:939-43. Maron BJ, Spirito P. Impact of patient selection biases on the perception of hypertrophic cardiomyopathy and its natural history. Am J Cardiol 1993;72:970-2. Spirito P, Rapezzi C, Autore C, et al. Prognosis of asymptomatic patients with hypertrophic cardiomyopathy and nonsustained ventricular tachycardia. Circulation 1994;90:2743-7. Cecchi F, Olivotto I, Montereggi A, Santoro G, Dolara A, Maron BJ. Hypertrophic cardiomyopathy in Tuscany: clinical course and outcome in an unselected regional population. J Am Coll Cardiol 1995;26:1529-36. Cannan CR, Reeder GS, Bailey KR, Melton LJ III, Gersh BJ. Natural history of hypertrophic cardiomyopathy: a population-based study, 1976 through 1990. Circulation 1995;92:2488-95. Maron BJ, Henry WL, Clark CE, Redwood DR, Roberts WC, Epstein SE. Asymmetric septal hypertrophy in childhood. Circulation 1976;53:9-19. Fiddler GI, Tajik AJ, Weidman WH, McGoon DC, Ritter DG, Giuliani ER. Idiopathic hypertrophic subaortic stenosis in the young. Am J Cardiol 1978;42:793-9. McKenna WJ, Deanfield J, Faruqui A, England D, Oakley CM, Goodwin JF. Prognosis in hypertrophic cardiomyopathy: role of age and clinical, electrocardiographic and hemodynamic features. Am J Cardiol 1981;47:532-8. Seidman CE, Seidman JG. Gene mutations that cause familial hypertrophic cardiomyopathy. In: Haber E, ed. Molecular cardiovascular medicine. New York: Scientific American, 1995:193-209. Thierfelder L, Watkins H, MacRae C, et al. α-Tropomyosin and cardiac troponin T mutations cause familial hypertrophic cardiomyopathy: a disease of the sarcomere. Cell 1994;77:701-12. Watkins H, Anan R, Coviello DA, Spirito P, Seidman JG, Seidman CE. A de novo mutation in α-tropomyosin that causes hypertrophic cardiomyopathy. Circulation 1995;91:2302-5. Watkins H, Conner D, Thierfelder L, et al. Mutations in the cardiac myosin binding protein-C gene on chromosome 11 cause familial hypertrophic cardiomyopathy. Nat Genet 1995;11:434-7. Bonne G, Carrier L, Bercovici J, et al. Cardiac myosin binding protein-C gene splice acceptor site mutation is associated with familial hypertrophic cardiomyopathy. Nat Genet 1995;11:438-40. Poetter K, Jiang H, Hassanzadeh S, et al. Mutations in either the essential or regulatory light chains of myosin are associated with a rare myopathy in human heart and skeletal muscle. Nat Genet 1996;13:63-9. MacRae CA, Ghaisas N, Kass S, et al. Familial hypertrophic cardiomyopathy with Wolff-Parkinson-White syndrome maps to a locus on chromosome 7q3. J Clin Invest 1995;96:1216-20. Stewart S, Mason DT, Braunwald E. Impaired rate of left ventricular filling in idiopathic hypertrophic subaortic stenosis and valvular aortic stenosis. Circulation 1968;37:8-14. Sanderson JE, Gibson DG, Brown DJ, Goodwin JF. Left ventricular filling in hypertrophic cardiomyopathy: an angiographic study. Br Heart J 1977;39:661-70. Spirito P, Maron BJ, Chiarella F, et al. Diastolic abnormalities in patients with hypertrophic cardiomyopathy: relation to magnitude of left ventricular hypertrophy. Circulation 1985;72:310-6. Spirito P, Maron BJ, Bonow RO, Epstein SE. Severe functional limitation in patients with hypertrophic cardiomyopathy and only mild localized left ventricular hypertrophy. J Am Coll Cardiol 1986;8:537-44. Nihoyannopoulos P, Karatasakis G, Frenneaux M, McKenna WJ, Oakley CM. Diastolic function in hypertrophic cardiomyopathy: relation to exercise capacity. J Am Coll Cardiol 1992;19:536-40. Thompson DS, Naqvi N, Juul SM, et al. Effects of propranolol on myocardial oxygen consumption, substrate extraction, and haemodynamics in hypertrophic obstructive cardiomyopathy. Br Heart J 1980;44:488-98. Pasternac A, Noble J, Streulens U, Elie R, Henschke C, Bourassa MG. Pathophysiology of chest pain in patients with cardiomyopathies and normal coronary arteries. Circulation 1982;65:778-89. Cannon RO III, Rosing DR, Maron BJ, et al. Myocardial ischemia in patients with hypertrophic cardiomyopathy: contribution of inadequate vasodilator reserve and elevated left ventricular filling pressures. Circulation 1985;71:234-43. O’Gara PT, Bonow RO, Maron BJ, et al. Myocardial perfusion abnormalities in patients with hypertrophic cardiomyopathy: assessment with thallium-201 emission computed tomography. Circulation 1987;76:1214-23. Cannon RO III, Dilsizian V, O’Gara PT, et al. Myocardial metabolic, hemodynamic, and electrocardiographic significance of reversible thallium-201 abnormalities in hypertrophic cardiomyopathy. Circulation 1991;83:1660-7. Maron BJ, Epstein SE, Roberts WC. Hypertrophic cardiomyopathy and transmural myocardial infarction without significant atherosclerosis of the extramural coronary arteries. Am J Cardiol 1979;43:1086-102. Maron BJ, Wolfson JK, Epstein SE, Roberts WC. Intramural (``small vessel’’) coronary artery disease in hypertrophic cardiomyopathy. J Am Coll Cardiol 1986;8:545-57. Harrison DC, Braunwald E, Glick G, Mason DT, Chidsey CA, Ross J Jr. Effects of beta adrenergic blockade on the circulation, with particular reference to observations in patients with hypertrophic subaortic stenosis. Circulation 1964;29:84-98. Cohen LS, Braunwald E. Amelioration of angina pectoris in idiopathic hypertrophic subaortic stenosis with beta-adrenergic blockade. Circulation 1967;35:847-51. Flamm MD, Harrison DC, Hancock EW. Muscular subaortic stenosis: prevention of outflow obstruction with propranolol. Circulation 1968;38:846-58. Rosing DR, Kent KM, Maron BJ, Epstein SE. Verapamil therapy: a new approach to the pharmacologic treatment of hypertrophic cardiomyopathy. II. Effects on exercise capacity and symptomatic status. Circulation 1979;60:1208-13. Hanrath P, Mathey DG, Kremer P, Sonntag F, Bleifeld W. Effect of verapamil on left ventricular isovolumic relaxation time and regional left ventricular filling in hypertrophic cardiomyopathy. Am J Cardiol 1980;45:1258-64. Bonow RO, Rosing DR, Bacharach SL, et al. Effects of verapamil on left ventricular systolic function and diastolic filling in patients with hypertrophic cardiomyopathy. Circulation 1981;64:787-96.
ten Cate FJ, Serruys PW, Mey S, Roelandt J. Effects of short-term administration of verapamil on left ventricular relaxation and filling dynamics measured by a combined hemodynamic-ultrasonic technique in patients with hypertrophic cardiomyopathy. Circulation 1983;68:1274-9. Bonow RO, Dilsizian V, Rosing DR, Maron BJ, Bacharach SL, Green MV. Verapamil-induced improvement in left ventricular diastolic filling and increased exercise tolerance in patients with hypertrophic cardiomyopathy: short- and long-term effects. Circulation 1985;72:853-64. Hess OM, Murakami T, Krayenbuehl HP. Does verapamil improve left ventricular relaxation in patients with myocardial hypertrophy? Circulation 1986;74:530-43. Udelson JE, Bonow RO, O’Gara PT, et al. Verapamil prevents silent myocardial perfusion abnormalities during exercise in asymptomatic patients with hypertrophic cardiomyopathy. Circulation 1989;79:1052- 60. Lorell BH, Paulus WJ, Grossman W, Wynne J, Cohn PF. Modification of abnormal left ventricular diastolic properties by nifedipine in patients with hypertrophic cardiomyopathy. Circulation 1982;65:499-507. Iwase M, Sotobata I, Takagi S, Miyaguchi K, Jing HX, Yokota M. Effects of diltiazem on left ventricular diastolic behavior in patients with hypertrophic cardiomyopathy: evaluation with exercise pulsed Doppler echocardiography. J Am Coll Cardiol 1987;9:1099-105. Betocchi S, Piscione F, Losi MA, et al. Effects of diltiazem on left ventricular systolic and diastolic function in hypertrophic cardiomyopathy. Am J Cardiol 1996;78:451-7. Betocchi S, Cannon RO III, Watson RM, et al. Effects of sublingual nifedipine on hemodynamics and systolic and diastolic function in patients with hypertrophic cardiomyopathy. Circulation 1985;72:1001-7. Pollick C. Muscular subaortic stenosis: hemodynamic and clinical improvement after disopyramide. N Engl J Med 1982;307:997-9. Frenneaux MP, Porter A, Caforio ALP, Odawara H, Counihan PJ, McKenna WJ. Determinants of exercise capacity in hypertrophic cardiomyopathy. J Am Coll Cardiol 1989;13:1521-6. Gilligan DM, Chan WL, Joshi J, et al. A double-blind, placebo controlled crossover trial of nadolol and verapamil in mild and moderately symptomatic hypertrophic cardiomyopathy. J Am Coll Cardiol 1993;21:1672-9. Gilligan DM, Chan WL, Stewart RA, Oakley CM. Adrenergic hypersensitivity after beta-blocker withdrawal in hypertrophic cardiomyopathy. Am J Cardiol 1991;68:766-72. Epstein SE, Rosing DR. Verapamil: its potential for causing serious complications in patients with hypertrophic cardiomyopathy. Circulation 1981;64:437-41. Gilligan DM, Chan WL, Stewart RA, Joshi J, Nihoyannopoulos P, Oakley CM. Cardiac responses assessed by echocardiography to changes in preload in hypertrophic cardiomyopathy. Am J Cardiol 1994;73:312- 5. Lever HM, Karam RF, Currie PJ, Healy BP. Hypertrophic cardiomyopathy in the elderly: distinctions from the young based on cardiac shape. Circulation 1989;79:580-9. Lewis JF, Maron BJ. Elderly patients with hypertrophic cardiomyopathy: a subset with distinctive left ventricular morphology and progressive clinical course late in life. J Am Coll Cardiol 1989;13:36-45. Fay WP, Taliercio CP, Ilstrup DM, Tajik AJ, Gersh BJ. Natural history of hypertrophic cardiomyopathy in the elderly. J Am Coll Cardiol 1990;16:821-6. Louie EK, Maron BJ. Hypertrophic cardiomyopathy with extreme increase in left ventricular wall thickness: functional and morphologic features and clinical significance. J Am Coll Cardiol 1986;8:57-65. Maron BJ, Gross BJ, Stark SI. Extreme left ventricular hypertrophy. Circulation 1995;92:2748. Robinson K, Frenneaux MP, Stockins B, Karatasakis G, Poloniecki JD, McKenna WJ. Atrial fibrillation in hypertrophic cardiomyopathy: a longitudinal study. J Am Coll Cardiol 1990;15:1279-85. McKenna WJ, England D, Doi YL, Deanfield JE, Oakley CM, Goodwin JF. Arrhythmia in hypertrophic cardiomyopathy. I. Influence on prognosis. Br Heart J 1981;46:168-72. Furlan AJ, Craciun AR, Raju NR, Hart N. Cerebrovascular complications associated with idiopathic hypertrophic subaortic stenosis. Stroke 1984;15:282-4. Spirito P, Lakatos E, Maron BJ. Degree of left ventricular hypertrophy in patients with hypertrophic cardiomyopathy and chronic atrial fibrillation. Am J Cardiol 1992;69:1217-22. McKenna WJ, Harris L, Rowland E, et al. Amiodarone for long-term management of patients with hypertrophic cardiomyopathy. Am J Cardiol 1984;54:802-10. Gosselink AT, Crijns HJ, Van Gelder IC, Hillige H, Wiesfeld AC, Lie KI. Low-dose amiodarone for maintenance of sinus rhythm after cardioversion of atrial fibrillation or flutter. JAMA 1992;267:3289-93. Prystowsky EN, Benson DW Jr, Fuster V, et al. Management of patients with atrial fibrillation: a statement for healthcare professionals: from the Subcommittee on Electrocardiography and Electrophysiology, American Heart Association. Circulation 1996;93:1262-77. Spirito P, Maron BJ. Absence of progression of left ventricular hypertrophy in adult patients with hypertrophic cardiomyopathy. J Am Coll Cardiol 1987;9:1013-7. Spirito P, Maron BJ, Bonow RO, Epstein SE. Occurrence and significance of progressive left ventricular wall thinning and relative cavity dilatation in hypertrophic cardiomyopathy. Am J Cardiol 1987;60:123-9. Shirani J, Maron BJ, Cannon RO III, Shahin S, Roberts WC. Clinicopathologic features of hypertrophic cardiomyopathy managed by cardiac transplantation. Am J Cardiol 1993;72:434-40. Morrow AG, Reitz BA, Epstein SE, et al. Operative treatment in hypertrophic subaortic stenosis: techniques, and the results of pre and postoperative assessments in 83 patients. Circulation 1975;52:88-102. Maron BJ, Merrill WH, Freier PA, Kent KM, Epstein SE, Morrow AG. Long-term clinical course and symptomatic status of patients after operation for hypertrophic subaortic stenosis. Circulation 1978;57:1205-13. Williams WG, Wigle ED, Rakowski H, Smallhorn J, LeBlanc J, Trusler GA. Results of surgery for hypertrophic obstructive cardiomyopathy. Circulation 1987;76:Suppl V:V-104-V-108. McIntosh CL, Maron BJ. Current operative treatment of obstructive hypertrophic cardiomyopathy. Circulation 1988;78:487-95. Cohn LH, Trehan H, Collins JJ Jr. Long-term follow-up of patients undergoing myotomy/myectomy for obstructive hypertrophic cardiomyopathy. Am J Cardiol 1992;70:657-60. Schulte HD, Bircks WH, Loesse B, Godehardt EA, Schwartzkopff B. Prognosis of patients with hypertrophic obstructive cardiomyopathy after transaortic myectomy: late results up to twenty-five years. J Thorac Cardiovasc Surg 1993;106:709-17.
ten Berg JM, Suttorp MJ, Knaepen PJ, Ernst SM, Vermeulen FE, Jaarsma W. Hypertrophic obstructive cardiomyopathy: initial results and long-term follow-up after Morrow septal myectomy. Circulation 1994;90:1781-5. Heric B, Lytle BW, Miller DP, Rosenkranz ER, Lever HM, Cosgrove DM. Surgical management of hypertrophic obstructive cardiomyopathy: early and late results. J Thorac Cardiovasc Surg 1995;110:195-208. Robbins RC, Stinson EB. Long-term results of left ventricular myotomy and myectomy for obstructive hypertrophic cardiomyopathy. J Thorac Cardiovasc Surg 1996;111:586-94. McCully RB, Nishimura RA, Tajik AJ, Schaff HV, Danielson GK. Extent of clinical improvement after surgical treatment of hypertrophic obstructive cardiomyopathy. Circulation 1996;94:467-71. Cooley DA, Leachman RD, Hallman GL, Gerami S, Hall RJ. Idiopathic hypertrophic subaortic stenosis: surgical treatment including mitral valve replacement. Arch Surg 1971;103:606-9. McIntosh CL, Greenberg GJ, Maron BJ, Leon MB, Cannon RO III, Clark RE. Clinical and hemodynamic results after mitral valve replacement in patients with obstructive hypertrophic cardiomyopathy. Ann Thorac Surg 1989;47:236-46. Klues HG, Roberts WC, Maron BJ. Anomalous insertion of papillary muscle directly into anterior mitral leaflet in hypertrophic cardiomyopathy: significance of producing left ventricular outflow obstruction. Circulation 1991;84:1188-97. McIntosh CL, Maron BJ, Cannon RO III, Klues HG. Initial results of combined anterior mitral leaflet plication and ventricular septal myotomy-myectomy for relief of left ventricular outflow tract obstruction in patients with hypertrophic cardiomyopathy. Circulation 1992;86:Suppl II:II-60-II-67. Schoendube FA, Klues HG, Reith S, Flachskampf FA, Hanrath P, Messmer BJ. Long-term clinical and echocardiographic follow-up after surgical correction of hypertrophic obstructive cardiomyopathy with extended myectomy and reconstruction of the subvalvular mitral apparatus. Circulation 1995;92:Suppl II:II-122-II-127. Kofflard MJ, van Herwerden LA, Waldstein DJ, et al. Initial results of combined anterior mitral leaflet extension and myectomy in patients with obstructive hypertrophic cardiomyopathy. J Am Coll Cardiol 1996;28:197-202.
Cooper MM, McIntosh CL, Tucker E, Clark RE. Operation for hypertrophic subaortic stenosis in the aged. Ann Thorac Surg 1987;44:370-8. Siegman IL, Maron BJ, Permut LC, McIntosh CL, Clark RE. Results of operation for coexistent obstructive hypertrophic cardiomyopathy and coronary artery disease. J Am Coll Cardiol 1989;13:1527-33. Marwick TH, Stewart WJ, Lever HM, et al. Benefits of intraoperative echocardiography in the surgical management of hypertrophic cardiomyopathy. J Am Coll Cardiol 1992;20:1066-72. Grigg LE, Wigle ED, Williams WD, Daniel LB, Rakowski H. Transesophageal Doppler echocardiography in obstructive hypertrophic cardiomyopathy: clarification of pathophysiology and importance in intraoperative decision making. J Am Coll Cardiol 1992;20:42-52. Shah PM, Gramiak R, Adelman AG, Wigle ED. Echocardiographic assessment of the effects of surgery and propranolol on the dynamics of outflow obstruction in hypertrophic subaortic stenosis. Circulation 1972;45:516-21. Henry WL, Clark CE, Griffith JM, Epstein SE. Mechanism of left ventricular outflow obstruction in patients with obstructive asymmetric septal hypertrophy (idiopathic hypertrophic subaortic stenosis). Am J Cardiol 1975;35:337-45. Schapira JN, Stemple DR, Martin RP, Rakowski H, Stinson EB, Popp RL. Single and two-dimensional echocardiographic visualization of the effects of septal myectomy in idiopathic hypertrophic subaortic stenosis. Circulation 1978;58:850-60. Spirito P, Maron BJ, Rosing DR. Morphologic determinants of hemodynamic state after ventricular septal myotomy-myectomy in patients with obstructive hypertrophic cardiomyopathy: M mode and two-dimensional echocardiographic assessment. Circulation 1984;70:984-95. Cannon RO III, McIntosh CL, Schenke WH, Maron BJ, Bonow RO, Epstein SE. Effect of surgical reduction of left ventricular outflow obstruction on hemodynamics, coronary flow, and myocardial metabolism in hypertrophic cardiomyopathy. Circulation 1989;79:766-75. Cannon RO III, Dilsizian V, O’Gara PT, et al. Impact of surgical relief of outflow obstruction on thallium perfusion abnormalities in hypertrophic cardiomyopathy. Circulation 1992;85:1039-45. Nishimura RA, Trusty JM, Hayes DL, et al. Dual-chamber pacing for hypertrophic obstructive cardiomyopathy: a randomized, double-blind, crossover study. J Am Coll Cardiol 1997;29:435-41. Nishimura RA, Hayes DL, Ilstrup DM, Holmes DR, Tajik AJ. Effects of dual-chamber pacing on systolic and diastolic function in patients with hypertrophic cardiomyopathy: acute Doppler echocardiographic and catheterization hemodynamic study. J Am Coll Cardiol 1996;27:421-30. Betocchi S, Losi MA, Piscione F, et al. Effects of dual-chamber pacing in hypertrophic cardiomyopathy on left ventricular outflow tract obstruction and on diastolic function. Am J Cardiol 1996;77:498-502. Spirito P, McKenna WJ, Schultheiss HP. DDD Pacing in obstructive HCM. Circulation 1995;92:1670-3. Sigwart U. Non-surgical myocardial reduction for hypertrophic obstructive cardiomyopathy. Lancet 1995;346:211-4. Maron BJ, Roberts WC, Epstein SE. Sudden death in hypertrophic cardiomyopathy: a profile of 78 patients. Circulation 1982;65:1388-94. DeRose JJ Jr, Banas JS Jr, Winters SL. Current perspectives on sudden cardiac death in hypertrophic cardiomyopathy. Prog Cardiovasc Dis 1994;36:475-84. McKenna WJ, Chetty S, Oakley CM, Goodwin JF. Arrhythmia in hypertrophic cardiomyopathy: exercise and 48 hour ambulatory electrocardiographic assessment with and without beta adrenergic blocking therapy. Am J Cardiol 1980;45:1-5. Canedo MI, Frank MJ, Abdulla AM. Rhythm disturbances in hypertrophic cardiomyopathy: prevalence, relation to symptoms and management. Am J Cardiol 1980;45:848-55. Maron BJ, Savage DD, Wolfson JK, Epstein SE. Prognostic significance of 24 hour ambulatory electrocardiographic monitoring in patients with hypertrophic cardiomyopathy: a prospective study. Am J Cardiol 1981;48:252-7. Nicod P, Polikar R, Peterson KL. Hypertrophic cardiomyopathy and sudden death. N Engl J Med 1988;318:1255-7. McKenna WJ, Franklin RC, Nihoyannopoulos P, Robinson KC, Deanfield JE. Arrhythmia and prognosis in infants, children and adolescents with hypertrophic cardiomyopathy. J Am Coll Cardiol 1988;11:147-53. Sadoul N, Prasad K, Elliott PM, Bannerjee S, Frenneaux M, McKenna WJ. Prospective diagnostic assessment of blood pressure response during exercise in patients with hypertrophic cardiomyopathy. Circulation (in press). Joseph S, Balcon R, McDonald L. Syncope in hypertrophic obstructive cardiomyopathy due to asystole. Br Heart J 1972;34:974-6. Chmielewzki CA, Riley RS, Mahendran A, Most AS. Complete heart block as a cause of syncope in asymmetric septal hypertrophy. Am Heart J 1977;93:91-3. Gilligan DM, Nihoyannopoulos P, Chan WL, Oakley CM. Investigation of a hemodynamic basis for syncope in hypertrophic cardiomyopathy: use of a head-up tilt test. Circulation 1992;85:2140-8. Maron BJ, Lipson LC, Roberts WC, Savage DD, Epstein SE. ``Malignant’’ hypertrophic cardiomyopathy: identification of a subgroup of families with unusually frequent premature death. Am J Cardiol 1978;41:1133-40. Saumarez RC, Slade AKB, Grace AA, Sadoul N, Camm AJ, McKenna WJ. The significance of paced electrogram fractionation in hypertrophic cardiomyopathy: a prospective study. Circulation 1995;91:2762-8. Spirito P, Watson RM, Maron BJ. Relation between extent of left ventricular hypertrophy and occurrence of ventricular tachycardia in hypertrophic cardiomyopathy. Am J Cardiol 1987;60:1137-42. Spirito P, Maron BJ. Relation between extent of left ventricular hypertrophy and occurrence of sudden cardiac death in hypertrophic cardiomyopathy. J Am Coll Cardiol 1990;15:1521-6. Pelliccia A, Maron BJ, Spataro A, Proschan MA, Spirito P. The upper limit of physiologic cardiac hypertrophy in highly trained elite athletes. N Engl J Med 1991;324:295-301. Maron BJ, Isner JM, McKenna WJ. Recommendations for determining eligibility for competition in athletes with cardiovascular abnormalities: Task Force 3: hypertrophic cardiomyopathy, myocarditis and other myopericardial diseases and mitral valve prolapse. J Am Coll Cardiol 1994;24:880-5. Maron BJ, Pelliccia A, Spirito P. Cardiac disease in young trained athletes: insights into methods for distinguishing athlete’s heart from structural heart disease, with particular emphasis on hypertrophic cardiomyopathy. Circulation 1995;91:1596-601. Maron BJ, Shirani J, Poliac LC, Mathenge R, Roberts WC, Mueller FO. Sudden death in young competitive athletes: clinical, demographic, and pathological profiles. JAMA 1996;276:199-204. Geibel A, Brugada P, Zehender M, Stevenson W, Waldecker B, Wellens HJ. Value of programmed electrical stimulation using a standardized ventricular stimulation protocol in hypertrophic cardiomyopathy. Am J Cardiol 1987;60:738-9. Kuck K-H, Kunze KP, Schluter M, Nienaber CA, Costard A. Programmed electrical stimulation in hypertrophic cardiomyopathy: results in patients with and without cardiac arrest or syncope. Eur Heart J 1988;9:177-85. Fananapazir L, Chang AC, Epstein SE, McAreavey D. Prognostic determinants in hypertrophic cardiomyopathy: prospective evaluation of a therapeutic strategy based on clinical, Holter, hemodynamic, and electrophysiological findings. Circulation 1992;86:730-40. Wellens HJ, Brugada P, Stevenson WG. Programmed electrical stimulation of the heart in patients with life-threatening arrhythmias: what is the significance of induced arrhythmias and what is the correct stimulation protocol? Circulation 1985;72:1-7. McKenna W, Harris L, Deanfield J. Syncope in hypertrophic cardiomyopathy. Br Heart J 1982;47:177-9. Nienaber CA, Hiller S, Spielmann RP, Geiger M, Kuck KH. Syncope in hypertrophic cardiomyopathy: multivariate analysis of prognostic determinants. J Am Coll Cardiol 1990;15:948-55. Dilsizian V, Bonow RO, Epstein SE, Fananapazir L. Myocardial ischemia detected by thallium scintigraphy is frequently related to cardiac arrest and syncope in young patients with hypertrophic cardiomyopathy. J Am Coll Cardiol 1993;22:796-804. Spirito P, Maron BJ. Relation between extent of left ventricular hypertrophy and age in hypertrophic cardiomyopathy. J Am Coll Cardiol 1989;13:820-3. Ceremuzynski L, Kleczar E, Krzeminska-Pakula M, et al. Effect of amiodarone on mortality after myocardial infarction: a double-blind, placebo-controlled, pilot study. J Am Coll Cardiol 1992;20:1056-62. The CASCADE Investigators. Randomized antiarrhythmic drug therapy in survivors of cardiac arrest (the CASCADE Study). Am J Cardiol 1993;72:280-7. The Cardiac Arrhythmia Suppression Trial (CAST) Investigators. Effect of encainide and flecainide on mortality in a randomized trial of arrhythmia suppression after myocardial infarction. N Engl J Med 1989;321:406-12. McKenna WJ, Oakley CM, Krikler DM, Goodwin JF. Improved survival with amiodarone in patients with hypertrophic cardiomyopathy and ventricular tachycardia. Br Heart J 1985;53:412-6. Fananapazir L, Leon MB, Bonow RO, Tracy CM, Cannon RO III, Epstein SE. Sudden death during empiric amiodarone therapy in symptomatic hypertrophic cardiomyopathy. Am J Cardiol 1991;67:169-74. Harris L, McKenna WJ, Rowland E, Holt DW, Storey GCA, Krikler DM. Side effects of long-term amiodarone therapy. Circulation 1983;67:45-51.